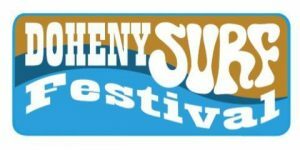 The Doheny State Beach Interpretive Association (DSBIA), as part of our annual fundraising efforts, will be hosting the 17th annual Doheny Surf & Art Festival, a two-day celebration of the California surfing lifestyle. The event will be held on Saturday, June 22nd from 9 AM to 7 PM and Sunday, June 23rd from 9 AM to 6 PM at historic DohenyState Beach. Your support and participation are welcomed. Booth space is available for the two-day event starting at $100 for a 10 ft. X 10 ft. space. Sponsorships are welcome at various tier levels, starting at $2,500. Tax-deductible donations will also be gratefully accepted and acknowledged. As always, the focus will be on the California surf culture and healthy living. Surf contests and expression sessions will be held on both days, sponsored by the Doheny Longboard Surfing Association. Traditional surf, Hawaiian and contemporary music will be provided. The Longboard Collectors Club will exhibit their surfboards throughout the weekend. KONA Brewing will again sponsor a beer garden and a food venue will be available. An opportunity drawing will also be held; your donation of goods or services is appreciated. The Festival will be run in-house with volunteers only. ALL proceeds go to benefit Doheny State Beach. Our anticipated attendance is between 5,000 and 6,000 environmentally conscious and active attendees with approximately 80 – 100 vendors. The surf festival will be promoted in social media (Instagram, Facebook and on our website) and in local magazines and newspapers delivered to homes and businesses, and on radio and television. Our festival tee shirts, all media, press releases, posters and banners will feature our sponsors: KONA Brewing, St. Joseph Health / Mission Hospital Trauma Center, and Re/Max Select One.